Plastic backing is the type of backing that all regular patches have, whether they’re embroidered, woven, or dye sublimated. This backing gives the patch rigidity and helps it keep its shape over the years. Plastic backings can be used on patches of every shape and size and are thin enough to allow you to sew your patch onto fabric. Heat seal backings are a special type of backing that when heated, will form a bond between the patch and the fabric. Despite what many think, these patches can’t be attached with a simple home iron. Instead, they need the proper amount of time, pressure, and temperature to seal correctly. This can be done using a heat seal machine, which can be found at most local sporting goods stores. 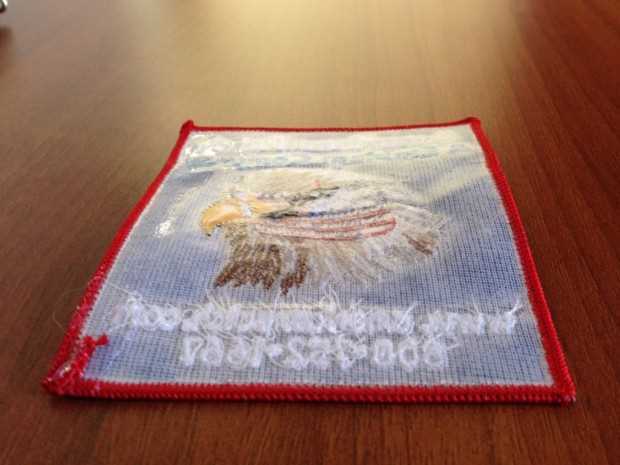 Hard hook & loop patch backings are often used for military patches and are popular among law enforcement branches. The backing is composed of tiny hooks and loops (much like the rough side of velcro) that allow you to attach the patch to a soft backing for a secure connection. Soft pile hook & loop patch backings are made from “fuzzy” material and can be attached to the rough side of velcro (or a hard hook & loop patch). Like the hard hook & loop backings, these backings are also often used for military patches and are popular among law enforcement branches – they’re often bought in conjunction with hard hook & loop backings to make a two-sided patch that can be sewn onto uniforms. Self-stick patch backings are made of a sticky adhesive. When you want to attach your patch to something, all you have to do is simply peel away the paper backing and press the patch onto the fabric or other material. While convenient, self-stick backings aren’t as durable as other backings. Clutch pin backings are often used in the military and can transform a patch into one that can be pinned to fabric instead of sewn, stuck, or heat sealed. When patches with pin backings are created, we place the flat part of the pin in between the patch and its backing and leave the sharp part of the pin out. That way, you can place the pin into the fabric and secure it with a backing. Like pin backings, magnetic patch backings enclose a small, a powerful magnet in between the patch and its backing. By placing an oppositely charged magnet on the other side of a piece of fabric or material, you can attach a patch without having to sew it, heat seal it, pin it, or stick it. This entry was posted in General Information and tagged backings, heat seal, military, police, security, sewing, uniforms.